Spicy buffaloed oven fried chicken bites wrapped in buttery lettuce leaves with tomatoes, quinoa, avocado, and blue cheese dressing. 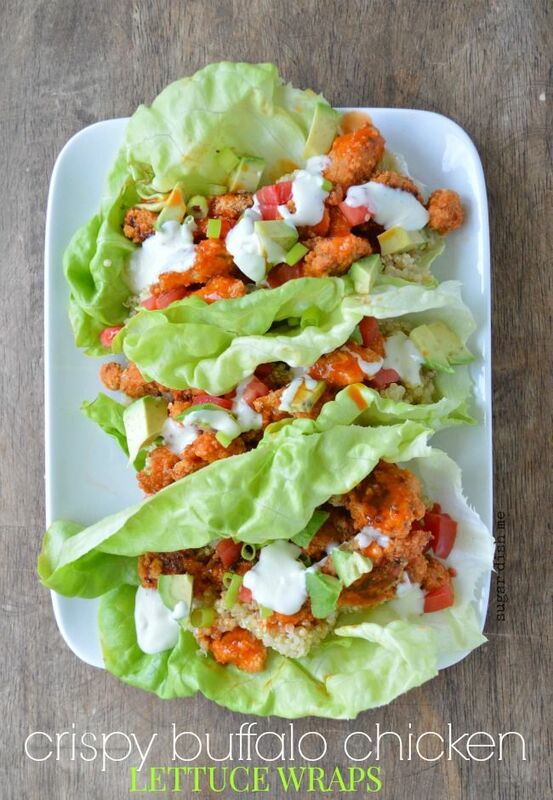 Buffalo Chicken Lettuce Wraps are a healthy and filling lunch or dinner your whole family will love. Note that prep time includes 30 minutes for the chicken to marinate. Preheat the oven to 375 and lightly grease (I used cooking spray) a baking sheet or line it with parchment paper. Toss the chicken in the ½ cup buffalo sauce, cover, and refrigerate for at least 30 minutes. Pour the breadcrumbs into a shallow dish. Coat each chicken piece evenly and place them on the prepared baking sheet. The baking sheet will get pretty crowded -- it's okay. Bake for 30 minutes. You can toss the baked chicken with the extra buffalo sauce if you like. To assemble the wraps, fill each leaf of lettuce with quinoa, tomatoes, and avocado. Top with the crispy baked buffalo chicken, drizzle with the blue cheese, and sprinkle with the green onions. These are also a delicious cold lunch if you prepare the chicken ahead of time and refrigerate it before serving.